The Department of Mathematics at Berkeley is generally recognized as one of the broadest, liveliest, and most distinguished departments of mathematics in the world. With approximately 55 regular faculty members representing most of the major fields of current research, along with 25 to 30 post-doctoral scholars, 180 graduate students, over 800 undergraduate majors, one of the finest mathematics libraries in the nation, and situated in a favorable climate in one of America's most exciting and cosmopolitan centers for mathematics research and teaching, Berkeley has become a favorite location for the study of mathematics by students and faculty from all over the world. 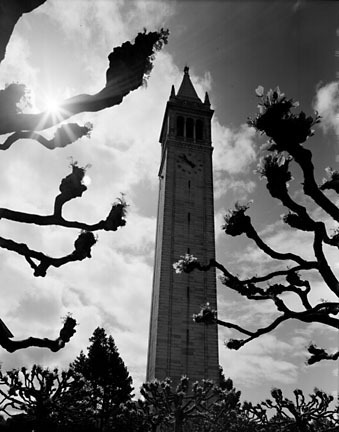 Since 1925, when the quality of its mathematics faculty was ranked eleventh in the nation by the American Council of Education, Berkeley improved dramatically, reaching fourth place in 1957, and second place in 1964. It achieved an unsurpassed ranking in 1970, which was reaffirmed in the most recent 1995 survey. The Department offices are located on the top four floors of Evans Hall, situated in the northeast quadrant of Berkeley's scenic hillside campus. Within this building, the Department has excellent facilities for a flourishing mathematical community. These include an 1800 square foot Common Room on the tenth floor overlooking San Francisco Bay, an outstanding computer laboratory on the seventh floor, 26 classrooms especially designed for mathematics instruction on the ground floor, and a calculus computer lab on the basement floor. The Mathematics Library on the first floor of Evans Hall, part of the system of University of California Libraries, provides researchers and students with access to world-class collections. Berkeley is increasingly interested in developing the talents of outstanding mathematics students and has a number of challenging honors-level courses. The Department encourages all major students to participate in the annual William Lowell Putnam Mathematical Competition. Additionally, the Department sponsors undergraduate teams in the annual Mathematical Contest in Modeling in which teams of 3 people write mathematical solutions to real-life problems. An active Mathematics Undergraduate Student Association (MUSA), of which all departmental majors are automatically members, contributes to making Berkeley a stimulating and rewarding place to study mathematics. Moreover, Women in Mathematics at Berkeley (WIM) serves to foster a community and provide a network amongst the undergraduate women in mathematics at Cal. Berkeley's mathematics education program is greatly enriched by its large number of graduate students, postdoctoral faculty and fellows, and visiting teaching in residence each year. They come from all over the world to teach courses, participate in seminars, collaborate in research, give talks at the weekly Mathematics Colloquium, and be available as consultants. An affiliated interdisciplinary group, with its own doctoral program, is the Group in Logic and the Methodology of Science. We have two NSF funded Research Training Groups: one in Representation Theory, Geometry and Combinatorics and one in Geometry, Topology and Operator Algebras. These groups run seminars, workshops and other activities and support graduate student and postdoctoral fellows in their areas of interest. The Department has several graduate student groups: the Mathematics Graduate Student Association (MGSA), comprising all graduate students, the Noetherian Ring, a group of women in mathematics, Unbounded Representation (Urep), promoting dialogue on diversity in the math community, and a student lecture series, Many Cheerful Facts. An exciting development was the establishment of the Mathematical Sciences Research Institute (MSRI) by the National Science Foundation in 1981. In a beautifully designed building on the hills above the Berkeley campus overlooking San Francisco Bay, about 1,700 mathematicians from around the world come each year to participate in research programs in a wide variety of mathematical topics. The combined and cooperative efforts of the Department, the Center, and the Institute provide a program of mathematics courses, workshops, seminars, and colloquia of remarkable variety and exciting intensity. For younger students with an interest in mathematics, MSRI administers the Berkeley Mathematical Circle. The Department of Mathematics---faculty, staff, and students---is committed to fostering an atmosphere of respect, collegiality, and sensitivity. The study of mathematics is challenging, often emotionally as well as intellectually; even mildly inappropriate behavior can have highly detrimental effects on one’s ability to focus. The math department upholds the policies of the university regarding discrimination and harassment. But beyond that, we strive to provide a welcoming and supportive environment for all, regardless of other characteristics that are irrelevant to the pursuit of mathematics, for example, size or socioeconomic status, in addition to the protected categories outlined in UC policy. In most situations, simple common sense and good judgment should suffice as guidance, but we appreciate that some questions of appropriate behavior can be more complex and subtle. Instead of focusing on this fine line, we encourage faculty, staff, and students to strive for their actions in all contexts to be genuinely respectful and supportive rather than merely appropriate. For guidance about your own behavior, or if you think you have experienced or witnessed discrimination or harassment of any kind, we urge you to seek advice and support. Any member of the faculty or staff whom you trust is an appropriate contact person, in particular the Chair and Vice Chairs, or the university resources listed below. When bringing concerns forward about discrimination or harassment, we will strive to treat these with discretion, respecting the privacy of individuals insofar as possible, but in some cases policy or law may require that department members contact an appropriate university authority. Also see our page on Resolving Problems & Complaints. Photo © Contemporary Images from Original Negative by Ansel Adams, UCR/California Museum of Photography, Sweeney/Rubin Ansel Adams Fiat Lux Collection, University of California, Riverside.